We understand that buying distillation equipment can be intimidating and scary, especially if you’re a beginner. That’s why the first thing we want you to know is that our primary focus is customer service and helping you find the right still and accessories for your needs. 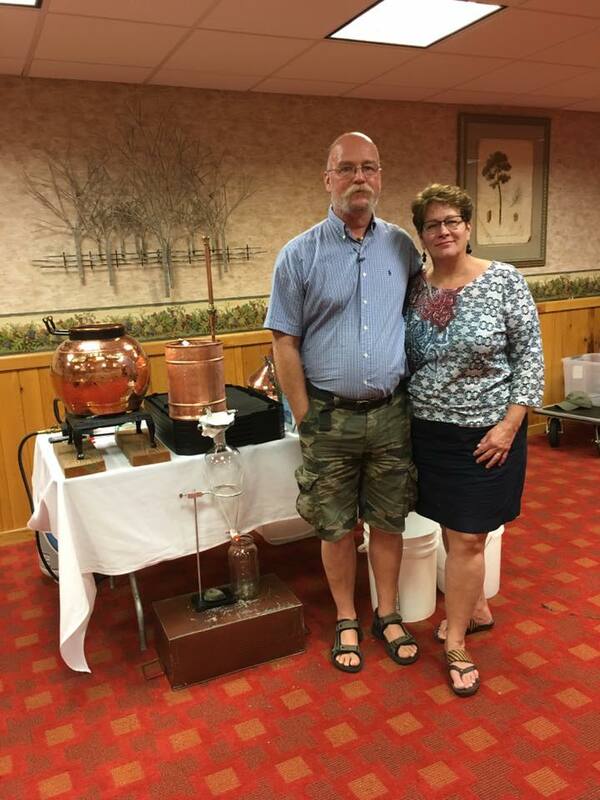 James Fulcher began his love of hydrosol distillation in 2014 when Liz lovingly ‘coerced’ him into participating in Ann Harman’s renowned Harvest to Hydrosols hydrosol distillation program. In 2017 James took over Copperstills.com from Ann and has been importing high-quality hand-crafted stills from Portugal ever since. James is a Certified Aromatherapist and for most of his adult life has pursued a deep passion for Primitive living and instruction in Primitive Survival Skills. Liz Fulcher brings over 25 years of essential oil experience, research and education to her work as a Clinical Aromatherapist and Essential Oil Educator. She has served as the Pennsylvania Regional Director for NAHA (The National Association of Holistic Aromatherapy) for 13 years. Her aromatherapy school, The Aromatic Wisdom Institute, is recognized by NAHA as a qualified school of Aromatherapy and Essential Oil studies. Her passion is empowering others to become creatively inspired by essential oils and follow their dream of becoming successful Aromatherapists. She loves teaching others what she’s learned about essential oils, building a business and doing what they love. In the classroom, she emphasizes hands-on experience and blending as much as possible because she believes it’s the best way to learn. Here’s just a few of the many benefits to purchasing your new copper still from Copperstills.com. We carry a large stock of both alembic stills and alquitar stills in a variety of sizes. All of our in-stock items will be shipped out the next business day. We will not sit on your order for days and ship it out when we want to. If you order an out-of-stock item, we can have it drop-shipped from the manufacturer to you, saving you weeks of time waiting for the new item to arrive by sea. You can expect a confirmation email immediately after placing your order, and secondly an email with your tracking number as soon as your order ships. If your order happens to be on back order, you will hear from us within the day. We won’t keep you waiting if we don’t have your product. All our alembic stills are soldered using copper, brass, silver or lead-free tin. These are all metals that are safe and commonly used for soldering products used in the food and beverage industry. We guarantee you are happy with your new copper still or we guarantee to make it right! We know what it’s like to be a beginner in distillation. Even after you’ve purchased your still, there are lots of parts and pieces you’ll still need before you can distill. The last thing you want to do after receiving your beautiful still is to wait for another 2-4 weeks before you locate and purchase all the accessories, which is why we offer our unique Copperstills Distillation Kits. When you receive your still and Distillation Kit, you will immediately have everything you need to get started except plastic tubing (available at any hardware store) your plants, water and fire! Our customer service is one of our most valuable assets. When you purchase your still or any distillation accessories from us, we begin a relationship. We’ve heard stories from customers who have purchased from popular e-commerce websites and been disappointed with the quality and lack of follow up or who have purchased directly from an overseas manufacturer and have had no recourse when there were problems with the still. We take care of all the nasty import paperwork for you, and stay in touch after the purchase. Many people are still hesitant to order online for fear of unsafe practices or companies that are not legitimate. We at Copperstills.com take online security very seriously. We will never show your information to any other company. We are not in the business to sell your information. We are in the business of supplying you with outstanding copper stills, Distillation Kits and accessories. Copperstills.com has numerous credit card fraud prevention services, provided by our online merchant processor. This ensures that orders made from Copperstills.com are not fraudulent. When you transmit credit card information to complete a purchase or verify data, we always transmit that credit card number in an encrypted format (SSL).